Triffiq has teamed up with GHD to gift one of their fans with an amazing hair straightener. To enter in their latest Triffiq GHD V Gold Classic Straighteners Giveaway grab your free entries by following few simple steps listed down below! The ghd brand is now a household name. Who could forget those classy adverts and the thou shalt slogans. From a time when hair straighteners were just hair straighteners, ghd straighteners made it chic to straighten your hair. Now it almost feels like there was no such thing as a hair straightener before ghd. 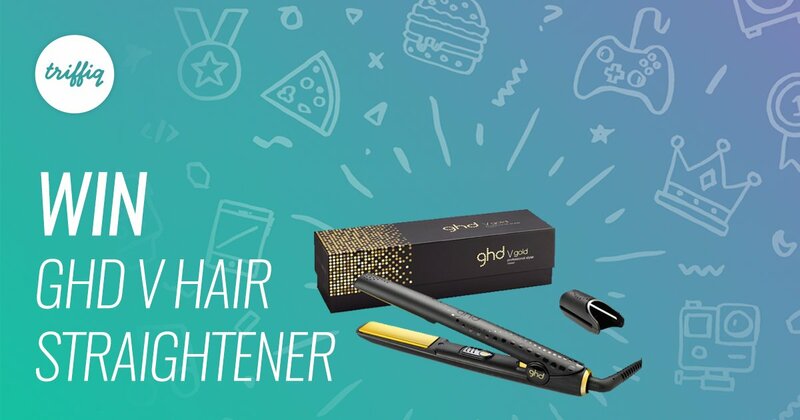 There is a lesson to be learned about branding from the ghd marketing department, the have sponsored the best reality shows and are now having their products used by the famous. Some of the greatest lovers for the ghd brand have been the press themselves. Hair and beauty editors of leading fashion and life style magazines have all promoted the benefits of the ghd straightener at some time or other. STEP 2 – Log in to a giveaway widget with your Triffiq account. STEP 3 – Watch the giveaway video to grab your entries. Winner will be contacted by email/social media. The winner has to reply back within a specified time period after notification to claim the prize.